Various factors influence people‘s choice of trading location. 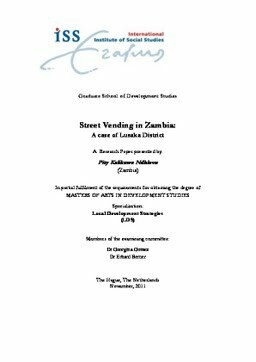 This paper analyses why street vendors despite the provision of formal market infrastructure still decide to trade from the streets. Theories of the informal economy were adopted to get insights into the issues of street vending. Based on survey results the study establishes that for street vendors accessibility of customers is a key consideration and they strategically locate on the streets to avoid formalisation costs such as rent, taxes and licences. Whereas for market traders selling from the formal market, a secure and clean environment is important. Therefore, policies of the informal economy should take into account the nuances and heterogeneity of the sector, in that, governments should come up with more inclusive policies that will accommodate all traders according to their practical needs and not perceived needs such as building formal market infrastructure for all.